The information that is made available through the semantic web will be accessed through complex programs (web-services, sensors, etc.) that may interact in sophisticated ways. 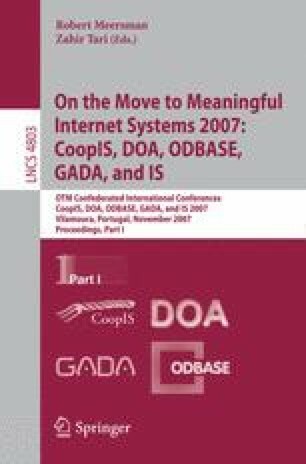 Composition guided simply by the specifications of programs’ inputs and outputs is insufficient to obtain reliable aggregate performance - hence the recognised need for process models to specify the interactions required between programs. These interaction models, however, are traditionally viewed as a consequence of service composition rather than as the focal point for facilitating composition. We describe an operational system that uses models of interaction as the focus for knowledge exchange. Our implementation adopts a peer to peer architecture, thus making minimal assumptions about centralisation of knowledge sources, discovery and interaction control.